Fruit smoothies for kids are the solution for you if you are worried that your child does not like eating fruits and vegetables and tends to prefer the less healthy ‘junk food’ option instead. 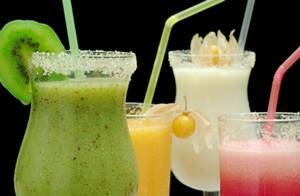 These drinks are not just yummy, but also very nutritious! Here are some recipes that your kids will definitely love! 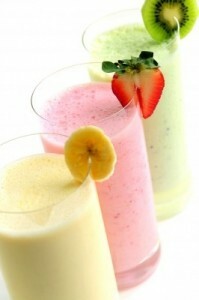 Fruit smoothies for kids are a great way to introduce them to healthier eating. This recipe contains strawberries, bananas, grapes, yogurt and milk. Firstly, chop a handful of both strawberries and grapes in half. Put this in the mixer along with an entire banana. Slosh in around 2 scoops of icy yogurt and add little bit of milk. To increase its appeal you can mix in some gummy bears when serving. Peaches mixed with honey are very good for both children’s and adults’ skin. To make this recipe, you require sugar or honey, yogurt, peaches and milk. First you need to slice the peaches and then put them I the mixer along with the yogurt and the honey or sugar. The amount of honey or sugar depends upon whether or not your child likes to eat sweet things. A good way of dealing with a child with a very sweet tooth is to make the smoothie with a little less sweetener each time until a more healthy level is achieved. The last step is to add three teaspoons of milk and this delicious drink is ready! Everyone likes to have chocolates. So this mix is a sure favorite among all the kids. The ingredients required are two medium sized bananas, vanilla flavored yogurt, chocolate syrup and chocolate chip cookies. First peel and chop the bananas and then put them into the mixer along with the yogurt and the chocolate syrup. Once it is well blended serve it chilled in a tall glass. Add the chocolate chip cookies in the end and mix them with a spoon so that they get evenly distributed. Dark chocolate syrup can also be used. Decorating healthy fruit smoothies for kids makes them even more appealing! This mix berry smoothies is great to get the kids to eat berries that are rich in antioxidants. You can use raspberries, blueberries and blackberries along with milk and yogurt and can also add some bananas. First put half a banana along with the blueberries, raspberries and blackberries in the mixer and mix them well. Then add in the yogurt and the milk. You can be make this drink more exciting by adding jelly beans or jelly drops when serving and mixing them in with a spoon for even distribution. All these recipes add an exciting twist to plain fruits. They are gulped down quickly by children in the summer when the temperatures are soaring outside. Along with the usual recipes, you can try out some new twists according to the likes and dislikes of your children. Adding jelly beans and gummy bears or jelly crystals make them more fun to drink. Coming up with fun presentation ideas for the smoothies – like giving them in glasses of unusual shapes and sizes makes them more interesting. The kids are also bound to love it when you add a paper umbrella dolly to the drink. Whilst not all the recipes are low calorie and some include some indulgent treats, they do include healthy fruits that are a great way to introduce children to healthier eating patterns. So make sure you try these healthy fruit smoothies for kids and also invent some of your own!